Data analytics has come to be a widely accepted and necessary part of any marketing strategy in any industry. In fact, according to the 2017 Big Data Analytics Market Study, big data adoption reached 53% in 2017 for all companies interviewed, with finance and telecom leading the way. As the finance industry has been quick to adopt big data, now is the time for banks and credit unions to take it one step further and use analytics to guide business decisions. The following guidelines can help you move beyond baseline analytics so you can take the right actions for your business. Arguably, the biggest benefit of employing data analytics at a bank or credit union is the predictive information it provides, such as attrition indicators, wealth indicators and other demographic statistics. With this insight, you can identify what your customers’ next financial moves might be, and subsequently get in front of them with cross-sell and up-sell opportunities. According to Boston Consulting Group, advanced analytics can point out product gaps with individual clients and across groups of clients and segments, which gives your relationship management teams talking points, tools, and guidance for product development. It is essential for customers to trust you so they feel comfortable sharing their personal information with you. Rather than viewing data as a means for driving conversations based on statistical correlations, strive to understand what your customers really want. If you target your messaging and marketing appropriately, you’ll be able to look beyond broader trends and dive deeper into the products and services that are most applicable for different customers. 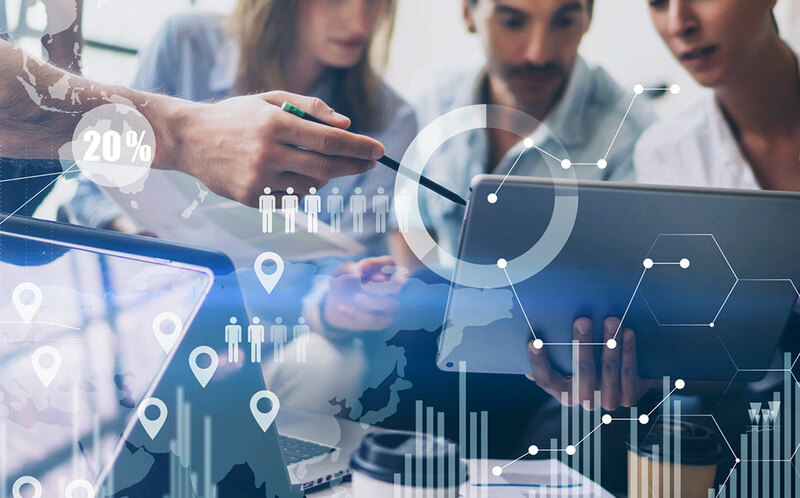 Be sure to keep your organization’s long-term goals top of mind when incorporating data analytics into your marketing strategy. If you do this, you’ll be able to identify customer behavior trends that you can capitalize on, and make the right decisions to achieve these goals. So, if you’re focused on targeting a particular demographic, you can closely analyze how customers and prospects in that demographic respond to marketing campaigns. This type of analysis will help you determine which products and services are most relevant to them, and it can provide an impetus for exploring new offerings and service areas. In order to stay focused on long-term goals, you need to consider all sides of your business. For example, which products and services are you pushing toward your millennial customers vs. your baby boomer customers? Are there specific locations or branches that need extra support? What matters most to your C-suite, and your division heads? Take a look at your data analytics with all of these views in mind, and you’ll be able to execute a comprehensive marketing strategy. Sometimes, taking the right action will require you to work quickly, and you won’t have enough time to conduct a deep analysis. You may need to mine unstructured feedback data in order to come up with an immediate plan for changes that need to be made in light of fast-moving trends that affect your business. You can choose the depth of your analytics based on your business priorities. If used strategically, data analytics can afford many benefits for banks and credit unions from a sales and marketing perspective. With the 360 View growth platform you can apply analytics not only to understand your customers better, but to take the right actions for your overall business. Schedule a demo today to get started.